Open Space is pleased to present a version of “Toward an Empathetic Art” in Spanish; it can be found immediately below the English translation. —Eds. Open Space se complace en presentar una versión de “Hacia un arte empático” en español; se encuentra justo debajo la traducción al inglés. 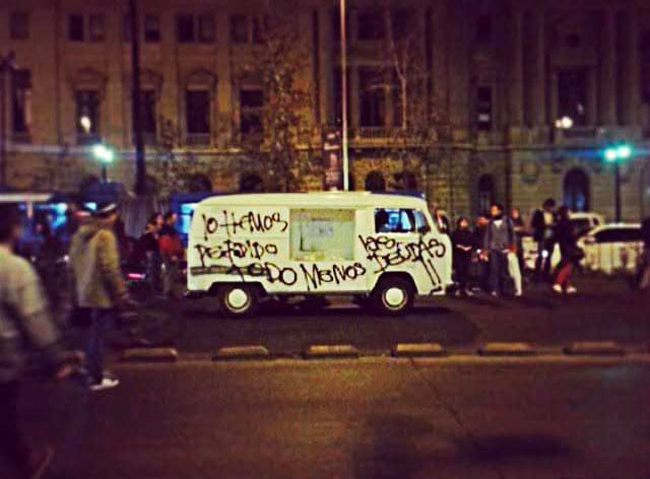 A police detective documents Francisco Papas Fritas’ Ad augusta per angusta (2014) at the Chilean Ministry of Culture. Francisco Papas Fritas, is a self-taught Chilean artist who rose to prominence in 2014 with Ad augusta per angusta, a work created in the midst of mass student protests against the privatization of education in Chile. During a student takeover, Papas Fritas entered the campus of a private university that was still collecting outstanding student debt, despite having gone bankrupt and lost accreditation. With the help of students, he sequestered the paper promissory notes — which, due to a quirk in the Chilean system, were the only documents legally binding students to their debt obligations — burned them, and displayed the ashes in front of the Ministry of Culture. Since then he has continued to explore acts of solidarity and collective justice in a country still grappling with the political, social, and economic consequences of the seventeen-year Pinochet regime, which ended in 1990. 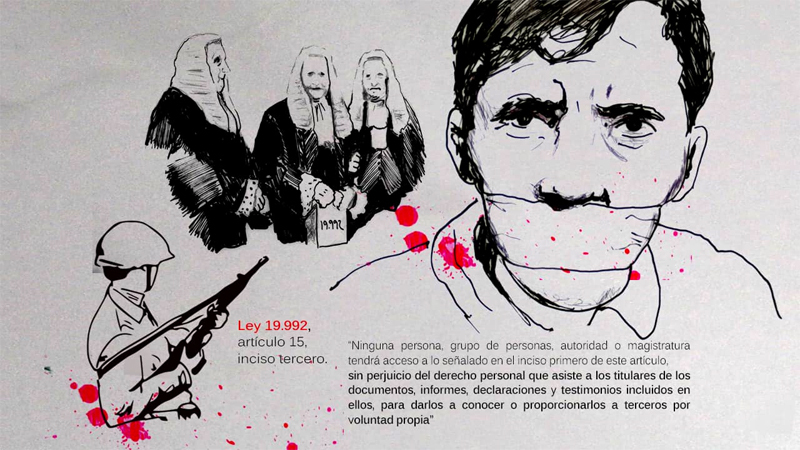 In Popular Desclassification (2015), Papas Fritas staged a public reckoning of human rights abuses during the dictatorship after the government ordered that the report of the National Commission on Political Prisoners and Torture be kept classified for fifty years, until 2054. He worked with survivors of torture who were interviewed by the commission, and therefore have a right to access their own files upon request, and gather documents held by the government. Despite attempts by the commission to hinder access to files beyond the testimony and documents given by victims to the commission, Papas Fritas and his collaborators were able to access previously classified information following two successful lawsuits against the government; they then used these to compile a public report. Ana Fox-Hodess spoke with Papas Fritas at his home via Skype to discuss the roles empathy, solidarity, and civil disobedience play in his artistic practice, and to reflect on strategies of resistance. Ana Fox-Hodess: As a self-taught artist in Chile, who do you consider to be your artistic references? Francisco Papas Fritas: Well, my artistic references have been political things, political acts. One important artist, who isn’t an artist as such, but for me is a great creative mind, is Lucio Urtubia, a Spanish bricklayer who swindled Citibank. He was a tremendous counterfeiter. An anarchist. At first he forged passports so that people who were involved with the Left in Europe or Latin America or Africa could travel freely and escape the dictatorships and repression that existed in their home countries. He managed to save a lot of people. Later on, he started forging money that people could use to organize — not to buy a car but to organize and continue the struggles against dictatorships, etcetera. He financed different groups, from the Black Panthers to the Tupamaros in Uruguay. And he created a whole Citibank check counterfeiting system and then figured out a way to cash these counterfeit checks. He pulled off the biggest scam in the history of Citibank. They were thrown for a loop that this bricklayer managed this level of artistry that only engineers and great professionals could do. Then, well, they caught him. They arrested him, and Citibank thought that the problem was solved there, but the checks kept circulating everywhere. So Citibank reached an agreement with him to destroy the master counterfeit plate in exchange for his freedom. And today, Lucio Urtubia, who must be maybe eighty, is free and living in Paris. AFH: I’m interested to know how you conceptualize solidarity in your artistic practice. FPF: For me the essential thing is empathy. I think it’s a revolution we, especially people on the Left, have to start. If you manage to have empathy, that is, to feel the pain and the problems of others as your own, you’re creating a much stronger society, with a stronger sense of community. What I try to do when I think of a project is start with things that produce empathy in me. It’s a feeling first, and then it becomes solidarity. But first I feel that empathy. We have to do away with this neoliberalism that people in Chile are steeped in — it creates tremendous individualization, and the existence of this individualism means that there’s no compassion. AFH: How do you position yourself in relation to that? Where does the artist fit in that context? FPF: My role is to be an artist. And not to be political, in a partisan sense. Yes, I am a political entity, but from my trench, which is art. In my work, I generate social consciousness, which can also be a tool for self-organization. AFH: Popular Declassification seems to reveal the fragility of the system when confronted by acts of solidarity. It exposes those little loopholes that can be exploited through collective action. AFH: So for you the big difference between this recent project and the 2014 student debt project with promissory notes is that in the earlier project, you were the author of that act, you were the author of the solution to debt problem, and this more recent project is a collective work? FPF: No, both were collective works. See, the burning of the notes was with students. But I took responsibility, and I am accountable in the eyes of the law. And from the perspective of the public, I am the person who burned promissory notes and solved a problem. Of course, once the notes were burned the students had to reject the debt, and if someone admitted that debt, they would have debt. So, even though in both cases people have to opt in to a solution, in one work [Popular Declassification] the idea that we are solving a problem together is much more radical. The principle is that there is an option for people to choose another path, an alternative to the current system. AFH: The other thing I see in these two projects is that both are interrogating ideas of legality, crime, and justice. In one, you opt for civil disobedience, and choose to use the strategy of working clandestinely, of entering a building to retrieve documents, and then burning them to destroy them — a sort of collective justice through civil disobedience, through breaking the rules. With Popular Declassification, however, while you’re still questioning issues of legality and legal structures, you’re also looking at strategies within the law to weaken the structures themselves. FPF: Exactly. What a neoliberal system does is ensure private property, basically. And it was through that logic that we could find fractures. What I mean to say is, while there is a fifty-year gag order, all of the documents and files related to one’s case as a torture survivor are considered that person’s property, because the individual gave testimony and provided information. And so the logic of private property allows that person to get those files and that information. After getting the personal file, each person can choose to remain an individual who protects this private property, or make it public. And that is what causes the fracture. That is to say, it is thanks to the possibility of private property that we could break open the secrets. AFH: You also have done several works with prisons. FPF: I have been working on prison issues for a long time, since crime and criminality are very demonized in Chile. I live a block away from the San Miguel prison, which is the site of, if not the deadliest, one of the deadliest fires that has happened in Chile. Eighty-one people here were burned to a crisp due to the negligence of the prison guards in charge. 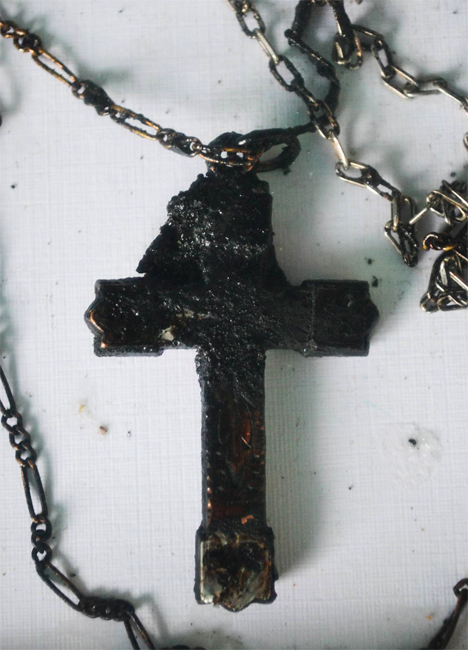 Chain with metallic cross and pieces of burned skin worn by deceased inmate Jorge Manríquez Pizarro at the time of the fire, framed in a 30x20x5 cm box and displayed as part of Francisco Papas Fritas’ Deber (Duty) (2012), which explores the responsibility of the Chilean state in the deaths of eighty-one inmates in the 2010 San Miguel prison fire. It was basically a murder, because the prisons are completely abandoned in Chile. They are highly questioned by various international human rights watch groups, but nothing is done for prisoners because the community does not feel any degree of empathy towards them. 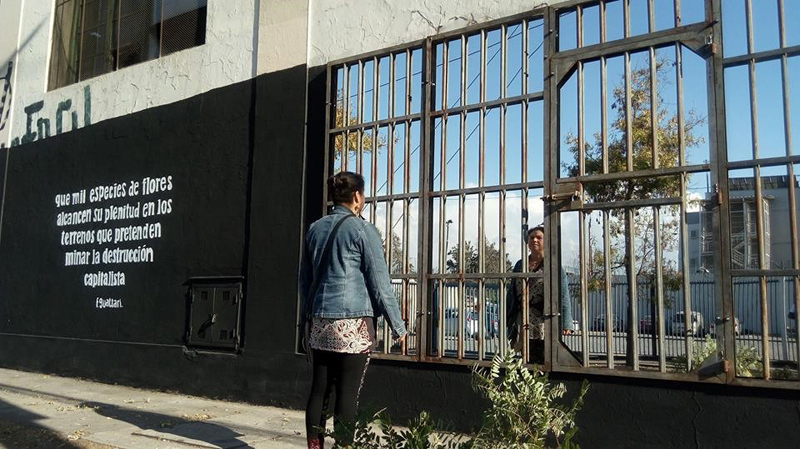 Actually, this Thursday I’ll be inaugurating a work which is composed of four meters of mirrors with jail bars on them, located right in front of the San Miguel prison, so that when passers-by walk past, they’ll see themselves reflected in the mirrors, as though they’re somehow locked up. I even started an organization, an NGO for prisoners. I spent three years working with families of prisoners. My house was the headquarters, since the local community center refused to engage with prisoners. The first three years I worked as executive director of that organization. Francisco Papas Fritas, Let a Thousand Flowers Bloom, 2017. AFH: Do you consider this NGO work as part of your artistic practice too? FPF: I think that all these things I do are artworks in one way or another. AFH: Do you think it’s important to distinguish the boundary between art and activism? FPF: I don’t know. Today people throw around the word “artivism” and I think it’s a joke. I started teaching myself how to be an artist when I was seventeen, and decided to study art alone, without going to college. As I got closer to art I realized that art was, in itself, political. Every gesture is political, and active. So I don’t understand this new idea of “artivism,” as though suddenly now art has become active. There is a political art, which can be neoliberal, as much of the art entering the mainstream today is, that’s made by artists interested in their CVs, in traveling, in being in the best museums, in the best collections of the best galleries. There is an art that seeks to prosper or get ahead in the market. And that is a politically neoliberal art, just as some art supported by the state serves as a sort of aestheticized advertisement for whatever the state wants to say. But there is also art that is criticizing the economy — the capitalist economy, the neoliberal economy — criticizing the state, criticizing accepted doctrines, and is mounting an aesthetic counterattack. And that art is generating awareness, and reflection, and networks. So I do not know, it seems that today with the problems that we’re facing, artists need to come down off their Mount Olympus and be humans, with ordinary problems, who are active, and proactive within this system that oppresses us. 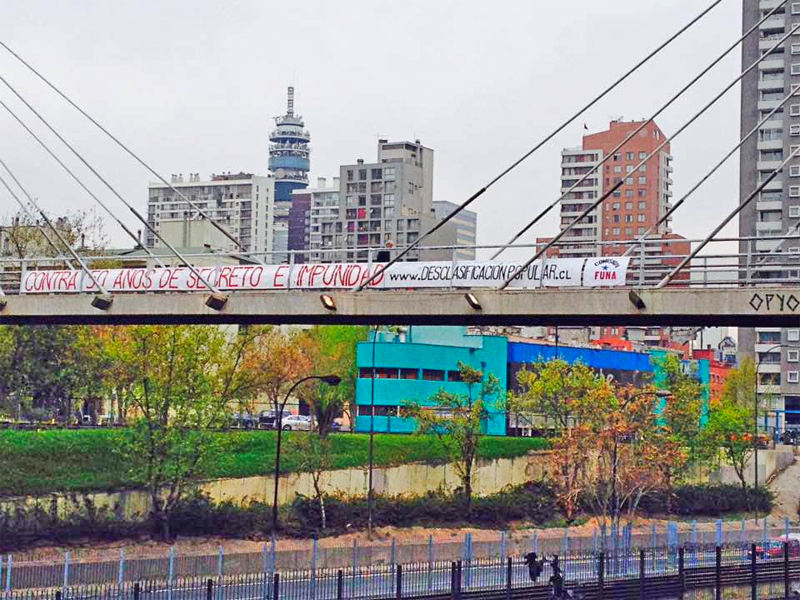 Un policía de investigaciones documenta la obra Ad augusta per angusta (2014) de Francisco Papas Fritas frente al Ministerio de Cultura en Santiago de Chile. Francisco Papas Fritas es un artista chileno autodidacta que subió a la prominencia en 2014 con Ad augusta per angusta, una obra creada durante las protestas estudiantiles masivas contra la privatización de la educación en Chile. Durante una toma estudiantil, Papas Fritas entró al campus de una universidad privada que todavía estaba cobrando la deuda pendiente de los estudiantes, a pesar de haber perdido la acreditación académica y estar quebrada financieramente. Con la ayuda de los estudiantes, secuestró los pagarés que, debido a una particularidad del sistema chileno, eran los únicos documentos que vinculaban legalmente a los estudiantes a sus obligaciones de deuda. 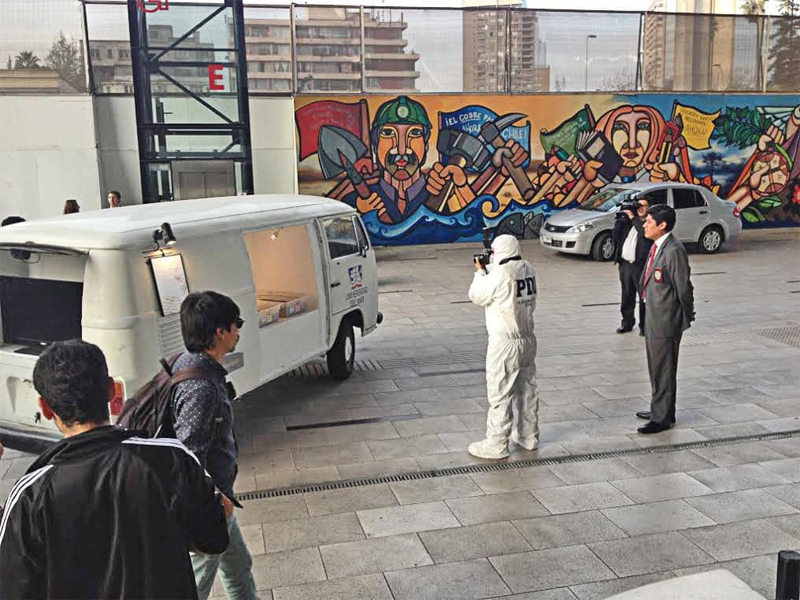 Luego los quemó y exhibió las cenizas frente al Ministerio de Cultura. Desde entonces, ha continuado explorando los actos de solidaridad y justicia colectiva en un país que aún lidia con las consecuencias políticas, sociales y económicas del régimen de Pinochet que terminó en 1990 después de diecisiete años de dictadura. En su proyecto Desclasificación popular (2015), Papas Fritas realizó un ajuste de cuentas público de los abusos contra los derechos humanos que ocurrieron durante la dictadura, después de que el gobierno ordenara que el informe de la Comisión Nacional sobre Prisión Política y Tortura se mantuviera clasificado durante cincuenta años, hasta el 2054. Trabajó con sobrevivientes de tortura entrevistados por la comisión y quienes, por tanto, tuvieron derecho a acceder a sus propios archivos a petición de éstos para reunir documentos guardados por el gobierno. A pesar de los intentos de la comisión de impedir el acceso a todo archivo más allá del testimonio y los documentos que habían sido entregados a las comisión por los propios sobrevivientes, después de dos querellas exitosas contra el gobierno, Papas Fritas y sus colaboradores lograron acceder a información previamente clasificada de la comisión, la cuál utilizaron para la elaboración de un informe público. Ana Fox-Hodess lo entrevistó en su casa a través de Skype, donde conversaron sobre la empatía, solidaridad y desobediencia civil en su práctica artística y él reflexionó sobre las estrategias de resistencia en el arte. Ana Fox-Hodess: En tu experiencia de ser artista autoformado en Chile, ¿quiénes consideras que son tus referentes artísticos? Francisco Papas Fritas: Buenos, mis referentes artísticos han ido siendo cosas políticas, actos políticos. De hecho, uno de los artistas, que no es artista propiamente tal, pero para mi es un gran creativo, es Lucio Urtubia, un albañil español que estafó a Citibank. Era un falsificador tremendo. Anarquista. Falsificó en primera instancia pasaportes para que la gente que estaba involucrada en las izquierdas de Europa, Latinoamérica o África pudiese viajar libremente o escaparse de la represión de las dictaduras o represiones que existían en cada país. Logró salvar a mucha gente. En segunda instancia era el dinero, que la gente pudiese mover dinero para organizarse. No para comprarse un auto sino para organizarse, y seguir construyendo así las luchas contra dictaduras, etcétera. Y él financió a distintos grupos desde los Black Panthers hasta los Tupamaros en Uruguay. Y él hace todo un sistema de falsificación de cheques de Citibank y después desarrolla un sistema para poder cobrar estos cheques. Y le hace la estafa más grande de la historia a Citibank. Los pone en jaque que un albañil básicamente haya hecho un trabajo de joyería. Y bueno, lo pillaron. Lo detuvieron, y el Citibank pensó que allí se solucionaba el problema, pero seguían habiendo cheques que se movían por todos lados. Entonces Citibank llegó a un acuerdo con él de romper la matriz, y al romper la matriz él quedó libre. Y llegó a ese acuerdo y Lucio Uturbia hoy en día debe tener sus varios años, no sé cuantos, ochenta años quizás, y está viviendo en París libremente. AFH: Me interesaría saber cómo conceptualizas la solidaridad en tu práctica artística. FPF: Básicamente para mí lo esencial es la empatía, es empatizar con el dolor del otro. Creo que es una revolución que tenemos que empezar a hacer, sobre todo las personas que tenemos una conciencia de izquierda, que es tratar de empatizar constantemente. Si tú logras tener una empatía, o sea, sentir el dolor, el problema del otro como tuyo, vas generando una sociedad mucho más consolidada, que transmite más comunidad. Entonces básicamente lo que trato de hacer cuando pienso en un proyecto son cosas que me producen empatía, y allí es cuando solidarizo con las causas. Es sentir primero, y luego se vuelve solidario. Pero primero es sentir esa empatía. Y hay que suplantar al rasgo neoliberal que está muy impregnado en las personas en Chile. Y eso hace que haya una individualización tremenda. Y al existir esa individualización no existe la compasión. AFH: Y tú, en tu rol como artista, ¿cómo te posicionas frente a eso? ¿Dónde cabe el artista en ese contexto? FPF: Mi rol es ser artista. Y no ser político, o sea, no ser político en el sentido partidista. Si soy una entidad política per se. Soy político, pero desde mi trinchera que es el arte. Entonces, lo que hago yo es que en mi trabajo genere una conciencia social y que pueda también ser una herramienta para auto-organizarse. AFH: Ese trabajo de la Desclasificación popular me pareció que revela la fragilidad del sistema enfrentado por los actos solidarios, o actos de colaboración de las personas. Que al activarse la gente se muestra la fragilidad de un sistema que tiene esas pequeñas escapatorias o tecnicismos que se pueden aprovechar a través de un acto solidario. FPF: Exacto, o sea, justamente. Todo y absolutamente todo tiene una fragilidad. Y lo que hay que hacer es buscar esa fragilidad y tratar de quebrarla, tratar de romperla, a través de actos de solidaridad, donde grupos distintos y diversos se pueden unir para una causa en común. Esta obra es muy distinta, por ejemplo, de la de los pagarés [Ad augusta per angusta], donde se genera una solución concreta. Pero para mí es mucho más maravillosa esta obra donde, tú dices, “Aquí hay una posibilidad de salida.” Ahora, tú eliges: si sigues por ese camino de quejarte, o sales realmente. AFH: Pero, ¿para ti entonces la gran diferencia entre el proyecto de los pagarés y este proyecto de Desclasificación popular tiene que ver con que en el primero tú fuiste el autor de ese acto y de esa solución al problema de las deudas, mientras en el otro es un trabajo colectivo? FPF: No, en ambos hay un trabajo colectivo. A ver, la quema de los pagarés fue junto con los estudiantes. Pero, digamos, la toma de responsabilidad es mía. Yo me hago responsable frente a la justicia. En la obra se entiende para el público que yo soy la persona que quema los pagarés y soluciona un problema. Pero también hay otro punto. Que la persona tenía que rechazar la deuda. O sea, si la persona admitía que tenía deuda, iba a tener deuda. Y nuevamente pusimos ese camino: de elegir. Entonces, si bien en ambos casos pasa lo mismo de poder elegir tu camino, en uno [Desclasificación popular] era mucho más radical la idea de que estamos solucionando un problema. Hay una opción en la ciudadanía de que pueda elegir otro camino, otra posibilidad al sistema operante. Captura de pantalla del sitio de Desclasificiación popular. AFH: Lo que yo veo también en esos dos proyectos es que ambos están interrogando la idea de la legalidad, de la criminalidad, y de la justicia. Y en Ad augusta per angusta optas por la desobediencia civil, optas por usar la estrategia de la clandestinidad, de entrar y sacar documentos, de quemar los documentos. Esa obra igual busca en cierta forma una justicia colectiva a través de la desobediencia civil, a través del cómo romper con las reglas de la legalidad. Mientras, me parece que en la obra más actual de la Desclasificación Popular, estás también cuestionando la legalidad, las estructuras legales, pero buscando estrategias dentro de la legalidad para debilitar las estructuras en sí. FPF: Exacto. Lo que hace un sistema neoliberal es velar con la propiedad privada, básicamente. Entonces, bajo esa enmienda pudimos encontrar las fracturas. Es decir, hay cincuenta años secretos, pero los papeles y todos los documentos que me guardaron para el secreto son de mi propiedad, porque yo los dije, yo los entregué, entonces la propiedad privada me permite a mí obtener esa información. Entonces ahí es cuando yo, como individuo en el sistema, saco esa información, y puedo elegir seguir siendo individuo que resguarda su propiedad privada, o hacerlo público. Y ahí es cuando se genera el quiebre. Ahí es cuando se enfrenta a lo ilegal, digamos, dentro de los márgenes de la legalidad. O sea, gracias a esa fractura, o esa posibilidad de lo privado, es que nosotros pudimos romper el secreto. AFH: Tú también has hecho varios trabajos con cárceles. FPF: Llevo mucho tiempo trabajando con temas carcelarios ya que es muy satanizado el delito en Chile, y la criminalidad. Yo vivo a una cuadra de la cárcel de San Miguel, y en esa cárcel ocurrió el incendio que ha generado más muertos en los últimos tiempos. Si no es el más grande que ha pasado en Chile, es uno de los más grandes, donde mueren 81 personas calcinadas por una negligencia de los policías que están a cargo. Cadena con cruz metálica y trozos de piel quemada que portaba el privado de libertad difunto Jorge Manríquez Pizarro. en el momento del incendio, enmarcado en una caja de 30x20x5 cm y expuesta como parte de la obra Deber (2012) de Papas Fritas, que exploraba la responsabilidad del Estado Chileno en la muerte de los 81 presos en el incendio de la cárcel de San Miguel en el 2010. Básicamente fue un asesinato. Porque las cárceles están completamente abandonadas en Chile. Están sumamente cuestionadas por los distintos observatorios de derechos humanos internacionales, y no se hace absolutamente nada por ellas porque la comunidad no siente ningún grado de empatía. Por ejemplo, el jueves inauguro una obra, son cuatro metros de espejos y encima van barrotes de cárcel, y esto está justo al frente a la cárcel de San Miguel, entonces la gente que pasa como transeúnte por allí puede verse reflejada en el espejo, encerrada de alguna u otra manera. Incluso levanté una organización, una ONG de privados de libertad. Estuve tres años trabajando con las familias de los presos. Mi casa fue la sede de las familias, ya que los de la sede vecinal no quisieron involucrarse con los presos. Los primeros tres años yo estuve trabajando como director ejecutivo de esa organización. Francisco Papas Fritas, Que mil flores alcancen plenitud, 2017. AFH: ¿Y tú consideras el trabajo de la ONG como parte de tu quehacer artístico también? FPF: Considero que todas esas cosas que hago son obras de alguna u otra manera. AFH: Y para ti, ¿por qué operar dentro del marco del arte, o cuál sería la importancia? ¿ees importante distinguir ese límite entre el arte y el activismo? FPF: No sé, hoy día se habla de “artivismo” y a mí me parece un chiste por que para mí, desde que me autoformé a los 17 años, yo decidí estudiar arte solo, sin ir a la universidad. Y cada vez que me iba acercando al arte me di cuenta de que el arte era político, de por sí. Cada gesto que uno realiza es política, la política es activa, es proactiva, desde un perfil crítico. Entonces, no entiendo esta nueva idea de artivismo, de que el arte como que ahora se vuelve activo. Hay un arte, que generalmente es político, que puede ser neoliberal, como muchas cosas del arte hoy en día que entran en el mainstream, en la máquina de hacer arte para el curriculum, para viajar, para estar en los mejores museos, para estar en las mejores colecciones de las galerías. Hay un arte que busca prosperar o progresar a partir de la economía. Y ese es un arte políticamente neoliberal, como han habido artes políticos que son del Estado, de lo que el Estado quiere decir y básicamente se muestran una publicidad para el Estado desde lo estético. Y hay un arte crítico que se pone en la otra vereda, que critica la economía capitalista, la economía neoliberal, al Estado, las doctrinas y que va realizando un contra-ataque desde lo estético, que va generando conciencia, reflexión, redes, etcétera. Entonces, pareciera que hoy en día con las problemáticas que tenemos, los artistas bajasen de sus olimpos para ser seres humanos y tener problemas comunes y corrientes y sentirse proactivos dentro de ese sistema que nos oprime.